Here it is! A rather delicious asparagus salad, and my new favourite brunch dish. I made this up over the weekend, based on a classic Italian combination and a starter my ex-chef friend made for a recent lunch party. 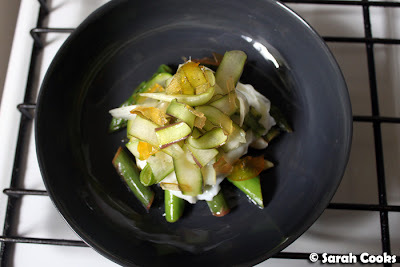 It has green, white and purple asparagus - some raw and sliced into fine shavings, some lightly cooked in chunks - with a soft-poached egg, parmesan cheese and mostarda di fruitta. Of course, I finished it with some lovely extra virgin olive oil, a squeeze of lemon juice, and plenty of freshly cracked salt and pepper - gorgeous with a thick slice of grainy sourdough toast to catch all the lovely juices. 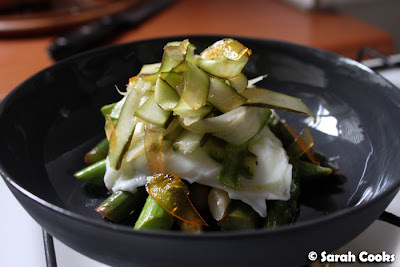 I must admit, I made this dish primarily because I had heaps of asparagus that needed to be used and I thought it would look pretty; I wasn't prepared for how wonderful it would taste! I'd bought a lot of asparagus the day before - a total impulse buy - at the Vic Market. I'm usually a stickler for recipes, and will only buy what's on my list. But when I saw the below display I couldn't resist! And without a final recipe in mind, I bought one bunch of each colour: white, purple and green. I'm glad to say this salad was the result of my impulsiveness. I was actually at the market on a guided tour, having been invited along to join in a Foodies Tour. 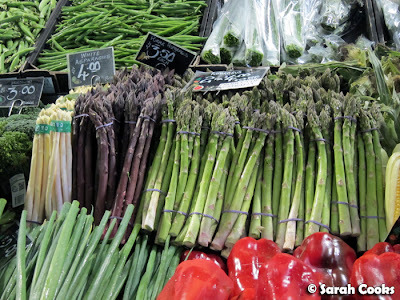 Whenever I'm travelling I love to wander through markets - some of my faves have been: Port Vila Market in Vanuatu, the Nishiki Food Market in Kyoto, Vienna's Naschmarkt, Barcelona's world-famous La Bouqueria and, of course, London's amazing Borough Market. I do shop at the Vic Market reasonably regularly, but usually I'm in too much of a hurry and am too busy elbowing my way through the crowds to stop and look around. It was really nice to take a different view of our very own Queen Vic Market, and I took heaps of photos just like a tourist! I've put the pics up on my Facebook page, so do check them out if you are interested. 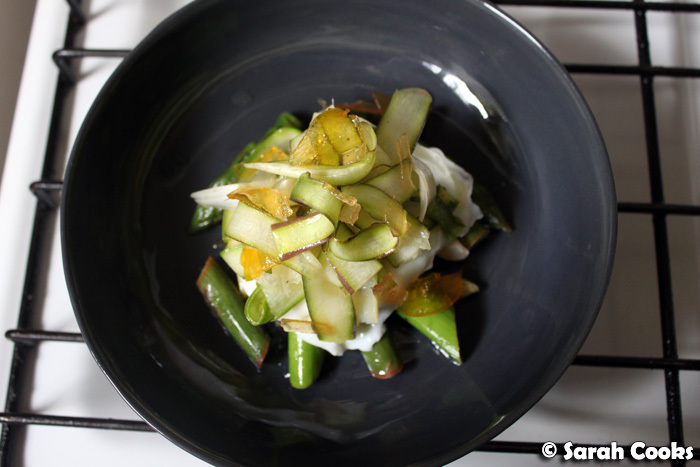 Now, back to the asparagus salad! 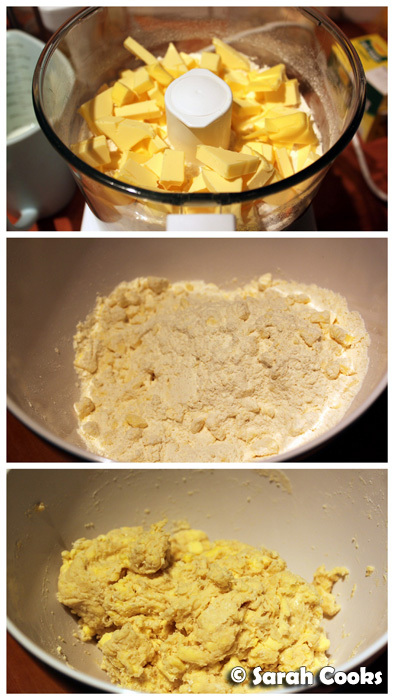 I've put the recipe in full at the bottom of this post, and have some pictures here of the steps involved. There's a bit of fiddly assembly involved, but it's not too difficult - and so worth the effort! Let's check out my new slate-coloured pebble bowl from Mud - and big thanks to my friends Soph, Alae and Kristine for giving me a Mud voucher for my birthday this year! I absolutely love it! Yay! Wash the asparagus stalks and snap off the woody ends. Take one stalk of each colour and use a vegetable peeler to slice them into thin shavings. Set aside. 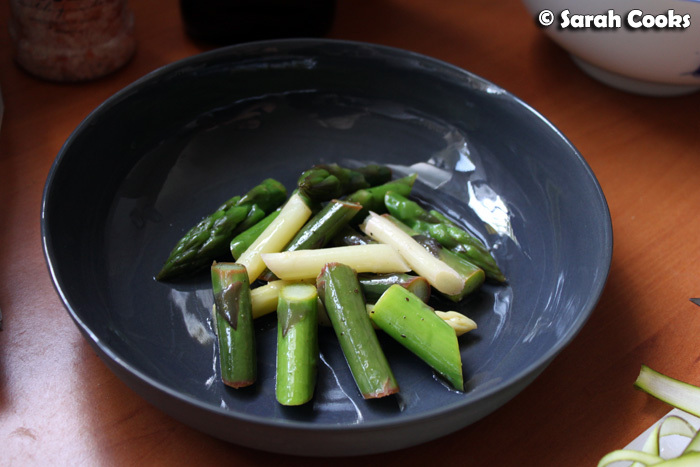 Slice the remaining asparagus stalks into 3cm lengths. Blanch in boiling salted water until tender but still crisp, about 2 minutes. Drain the asparagus pieces, cool under cold running water and drain again. Poach an egg in simmering water until cooked to your liking. Meanwhile, to make the dressing, stir the olive oil and lemon juice in a small bowl, and season to taste with salt and pepper. 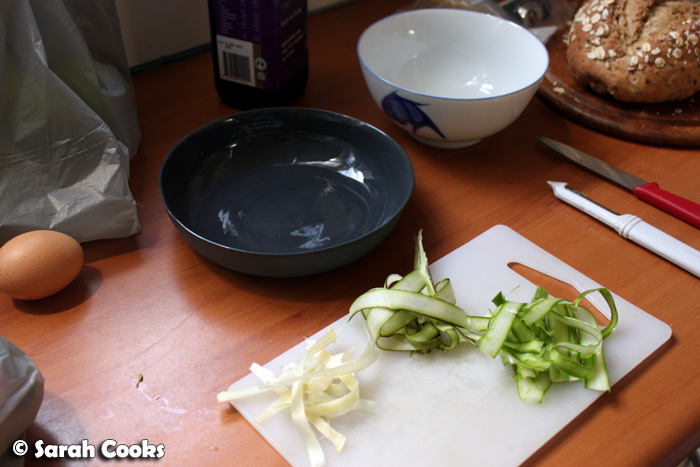 Swirl the cooked asparagus pieces in the dressing to coat, and place on a serving plate. 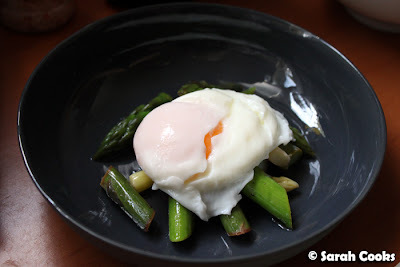 Place the drained, poached egg on top. 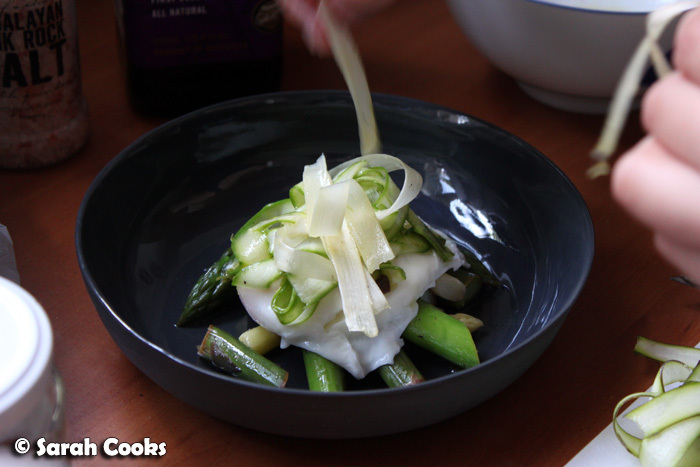 Swirl the asparagus shavings in the dressing to coat, and pile on top of the egg. Add shavings of Parmesan cheese and thin slices of mostarda di frutta. 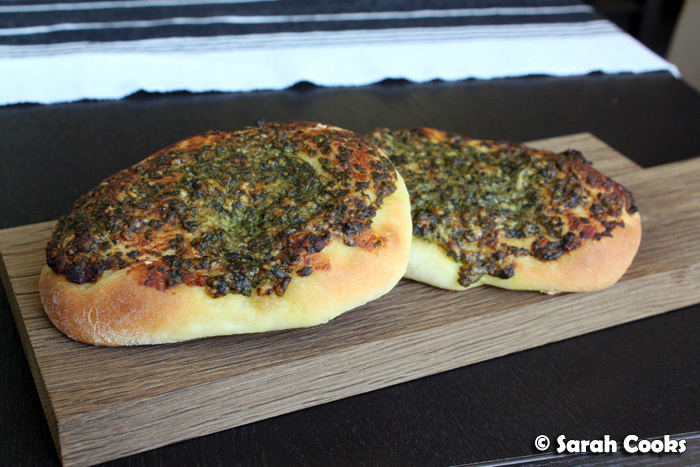 Drizzle generously with more olive oil and sprinkle with salt and pepper. 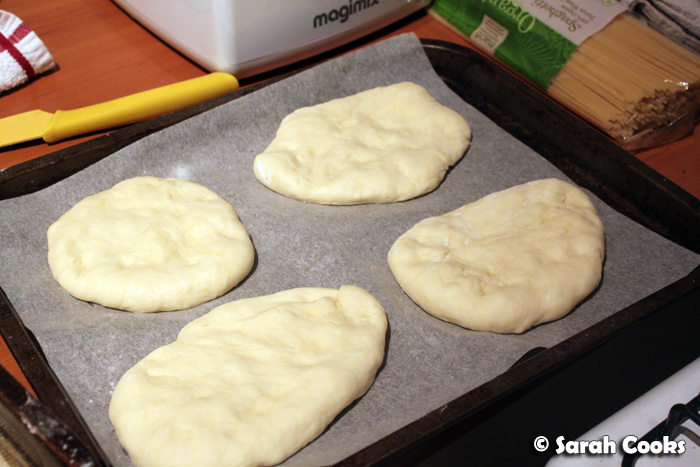 Serve with thick slices of sourdough or multigrain toast. 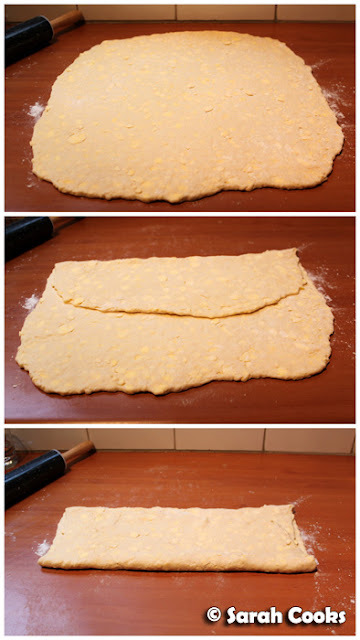 Ever since I bought Nigella's How to be a Domestic Goddess, I've wanted to make her Danish pastry recipe. However, it always seemed too time consuming, despite being a sped-up version. You need to let it rest and rise twice, then there's the rolling and the shaping and the ensuing mess. 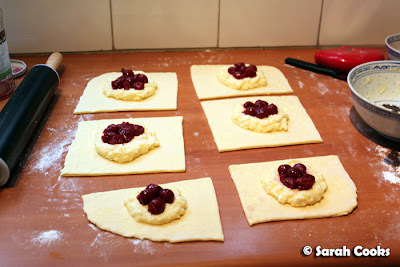 And what on earth would I do with 6 danishes? (That's a rhetorical question). But buoyed by my experience with croissants, puff pastry and Tartine's flaky pastry (which is essentially an un-laminated rough-puff pastry), and with a free weekend ahead of me, I thought it wouldn't hurt to give them a go. Danish pastry is the same as croissant dough - that is, a yeasted laminated dough. 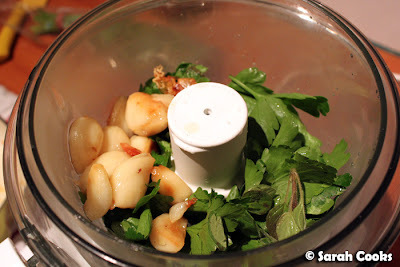 Nigella's recipe is a quick processor version. 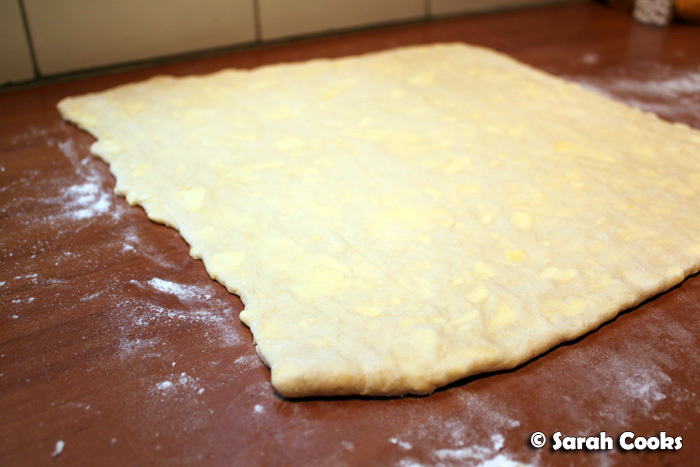 Rather than wrapping the dough around a flat square of butter before starting to roll, in this version the butter is distributed throughout the dough in small, pebble-like pieces. ... and you can see the layers building up. And ta-dah! Here is the finished dough. 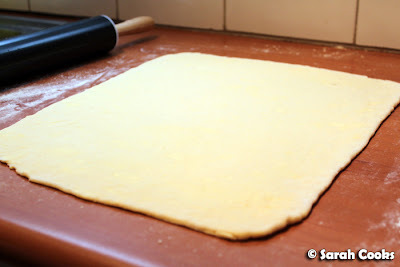 I love how smooth it gets, compared to the rough and shaggy ball of dough you start with. 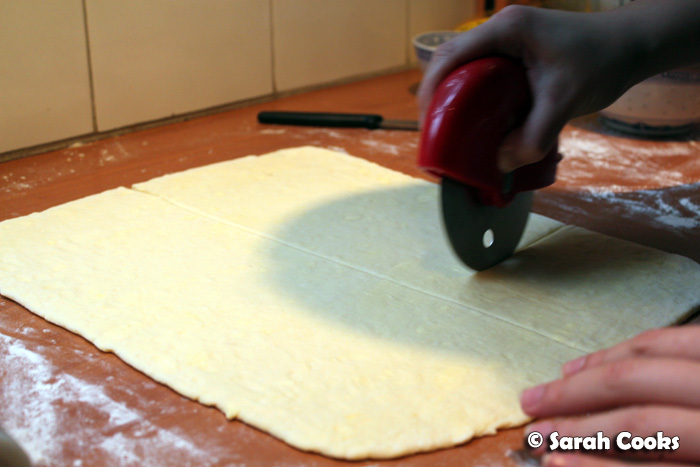 I used a pizza cutter to slice the dough. This way you get minimal tear-and-drag along the edge of the dough, so the layers rise more evenly. So, the recipe makes enough for two batches Nigella has two versions in her book: cheese danish, and an almond danish. 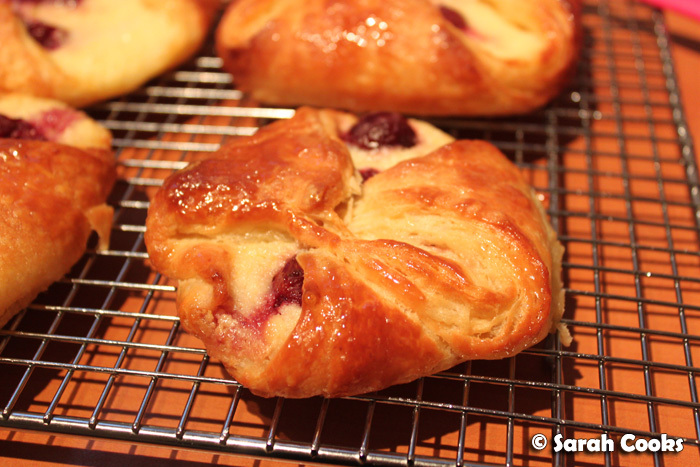 I made cheese and cherry danishes with the first batch, and stashed the remainder in the freezer for a later batch of almond danishes. As you can see above, the pieces weren't particularly even. Oops! 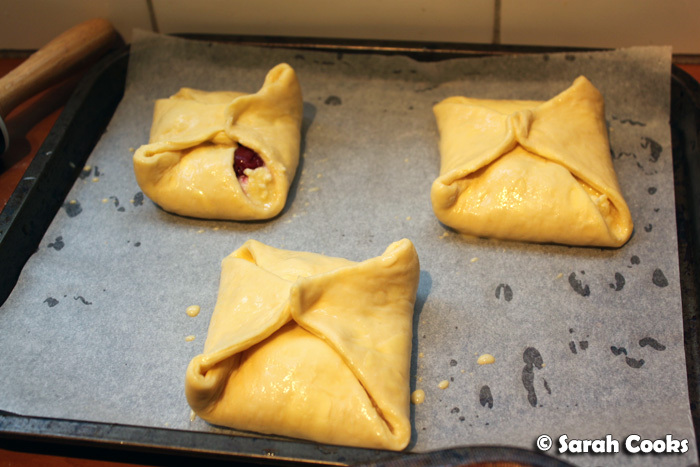 But still, I managed to bring them together into rough Danish pastry shapes. 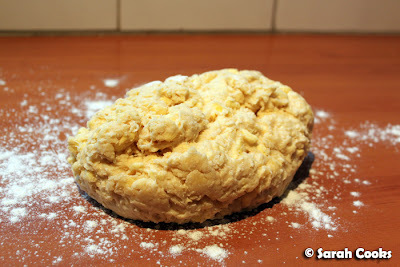 ...and then baked! The recipe calls for you to brush the baked danishes with a clear sugar glaze, and then drizzle a white sugar glaze over the top. I'm not a fan of my sweets being too sweet, so I skipped the second glaze. You can see in the above photo the comparison with and without the clear glaze. It's quite pretty, but I'm not sure it's completely necessary. Do you think it makes a big difference? You'll also notice that some of the pastries came unstuck while being baked - a combination of too much wet filling, and my not sealing the edges tightly enough. I think next time I'll avoid ricotta for a firmer German / Eastern-European cheese, like twaróg, or those hefty blocks of Tempo's continental cottage cheese. 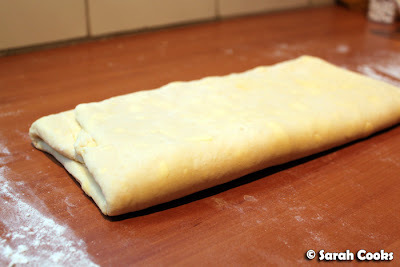 That's probably about as close as I can get to Topfenstrudel in Australia! Oh yes, and the taste? These danishes were incredible. 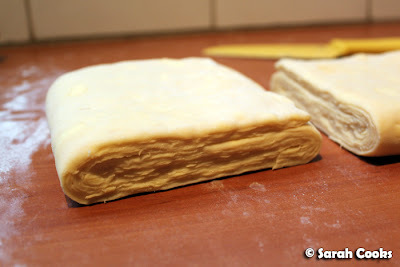 I loved the soft flaky pastry and its total butteriness (I've decided that's a word). They're actually super easy to make, and I found that Nigella's recipe worked very, very well. I told you I also made almond Danishes, yes? 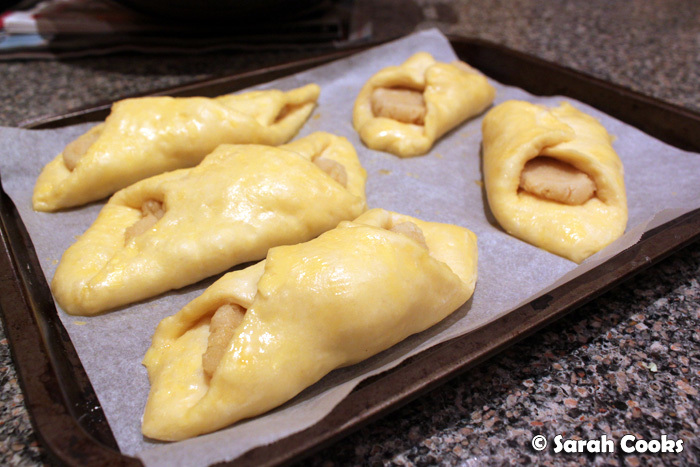 I did these a few days later (with the dough frozen in the meantime), to take to my parents' house for dessert. 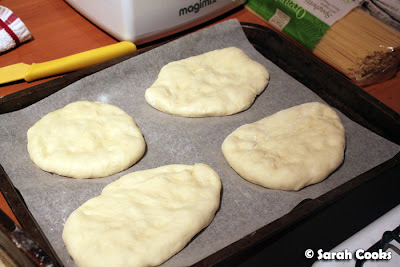 The dough puffed up heaps because it proved in a much warmer spot! 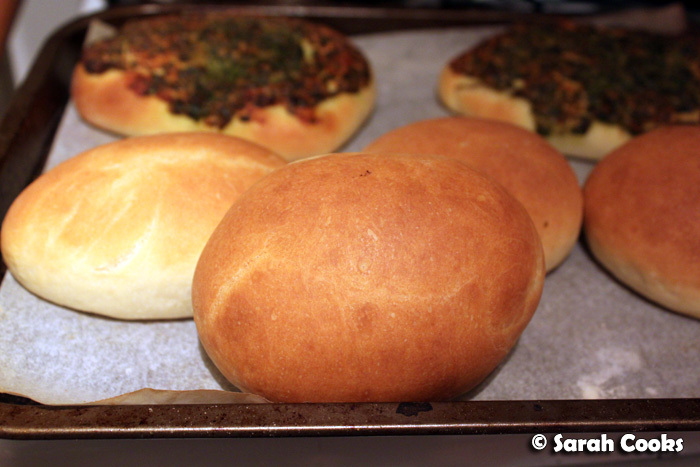 And here they are, all baked. I didn't bother with the sugar glaze this time as I was in a hurry. 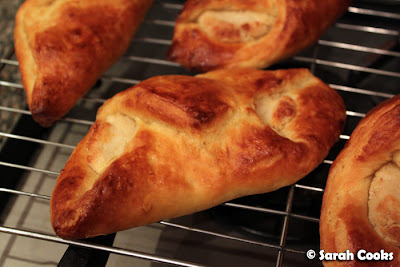 I'm so glad I finally got around to making these - yum yum and so much fun! 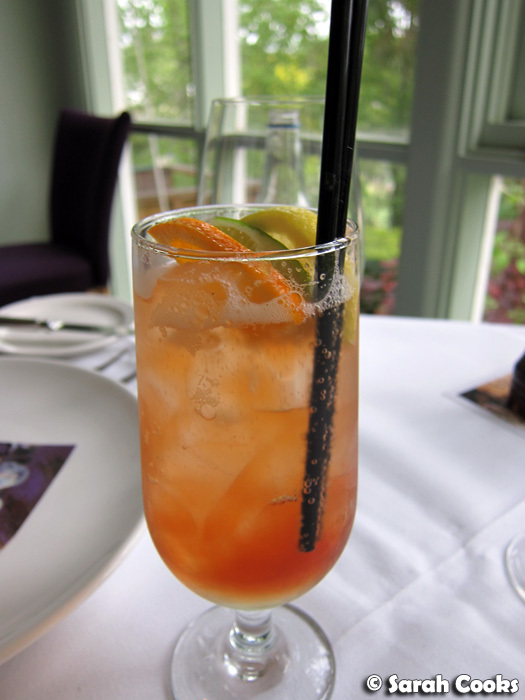 Such a lovely breakfast or afternoon indulgence with a cup of coffee. 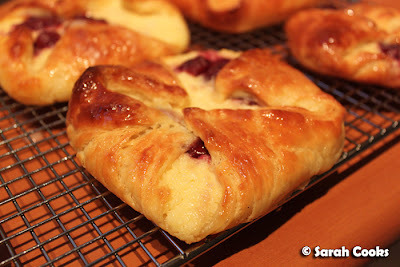 I'll definitely be making these again, perhaps even making croissants out of the dough. 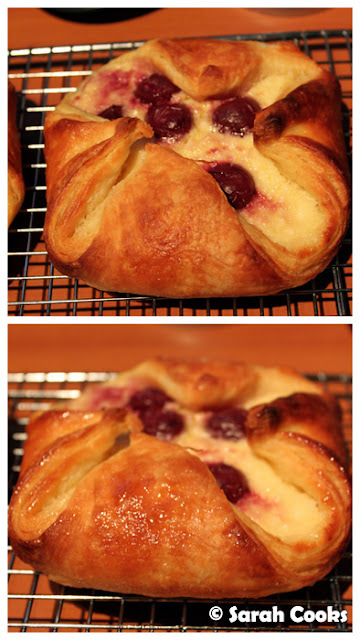 (So much faster and easier than the full croissant/danish dough I've made previously). 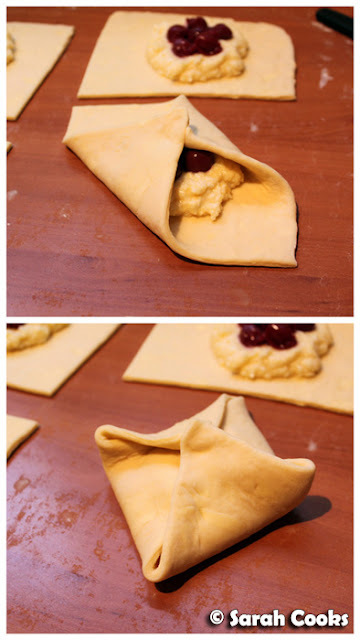 I'll want to play around with the fillings too - what are your favourite danish fillings? I wanted a hearty accompaniment for a simple spaghetti bolognese, but wanted something a little more special than a squidgy frozen loaf from the supermarket. 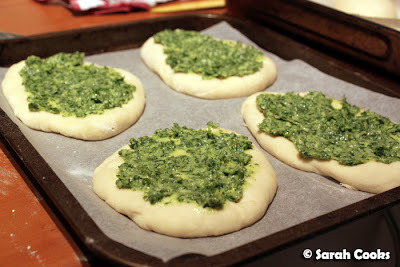 So I rolled up my sleeves and whipped up Nigella's garlic and parsley hearthbreads. The more eagle-eyed among you will notice that I have made this before, seven years and a day ago, in fact! After all that time, I think it's due for a repeat, don't you? The dough is a standard white-flour yeast dough, with a bit of olive oil and salt added. It's topped with a mixture of roasted garlic, parsley and olive oil. I added fresh oregano as well, because I had some and because I love it! 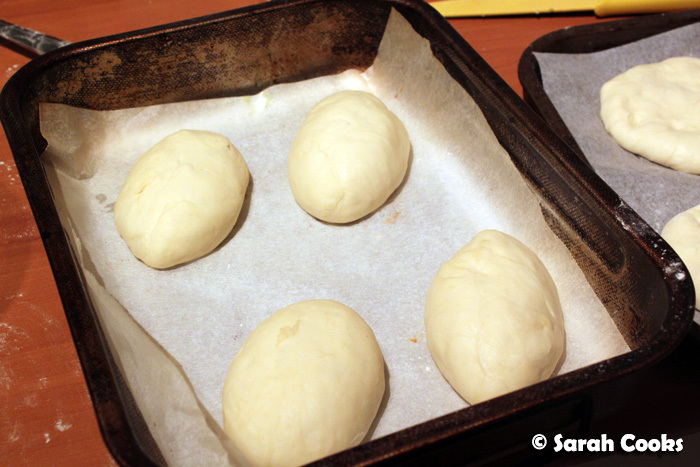 I didn't think we'd get through 8 hearthbreads with dinner, so I made half the dough into little football bread roll shapes to eat later! 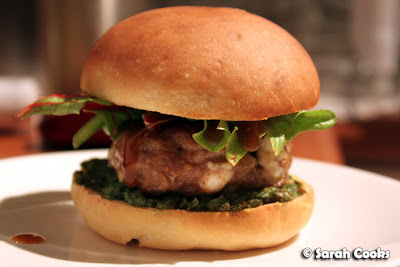 The next day, I defrosted some feta-stuffed Frikadellen for dinner, but instead of eating it with potatoes and gravy, I made myself a mini burger. 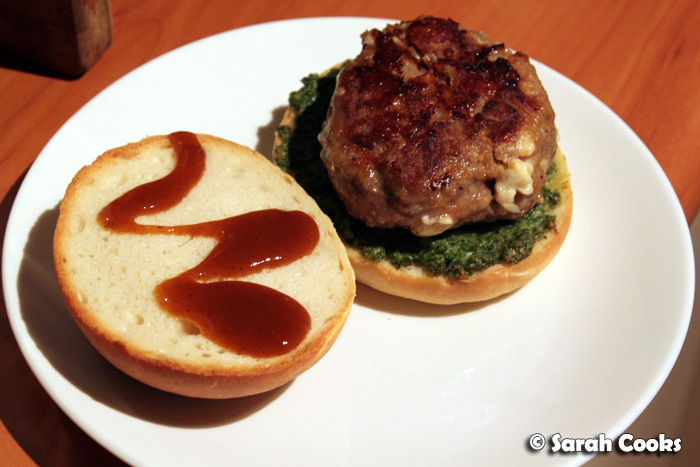 I halved and toasted one of the bread rolls, spread it with some of the leftover garlic paste, and topped it with the Frikadelle and some curry ketchup. For a special occasion dinner in Daylesford, it had to be The Lake House. So, you may have seen that Alla Wolf-Tasker herself commented on my post about Wombat Hill House. Cool, huh? I think it's pretty great that someone so long-standing in the industry is still interested in and keeps up with what's being said about her work - so assuming that she does read this post: HI ALLA! I was delighted to be seated right next to a window, with a nice view of the trees. 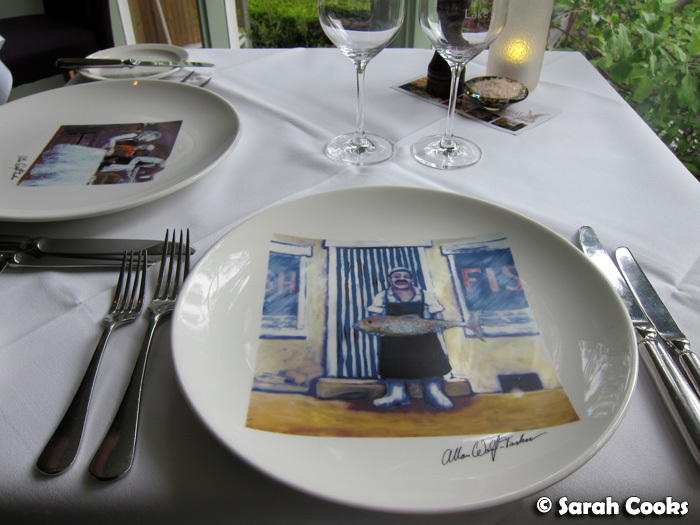 Not only was it a lovely spot, but it was great for taking pictures of the food! I never use flash photography for food pictures in restaurants - I think that taking one or two flash photos of the people you're with is acceptable, repeated flash photographs of all the dishes throughout the evening is not - so I always think of it s a bonus when there's a lot of natural light. We were there for a few hours, and you'll also see that my pictures get darker as the night went on. 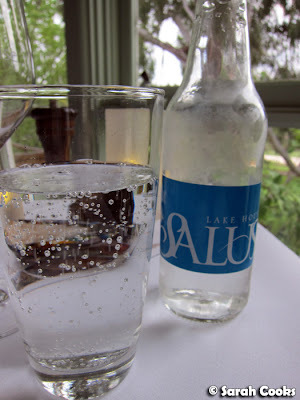 The staff were also very nice - it seems that Lake House and Wombat Hill House share some staff, and two of them recognised us from our visit to Wombat Hill House and said hi! I started with a refreshing bitters lime and soda, and I loved the attention to detail - how cute is the 3-citrus garnish? We were told that you could have a full degustation menu (a vegetarian option was also available), or the option of three courses from their fixed price menu ($105), with an optional cheese course for an $18 supplement. The vegetarian degustation menu actually looked amazing, and was well priced (approximately $130 from memory), but being big meat eaters, we weren't sure if it would be filling enough, so went for the fixed price menu. Between us we ordered one three-course, and one four-course option, and shared the cheese course. First, we were brought a little amuse bouche of nori crisps with bonito aioli. 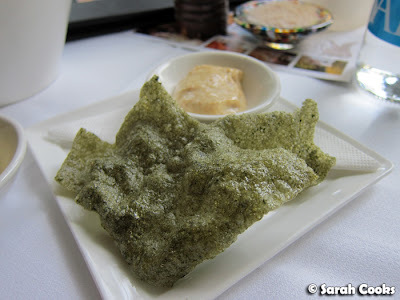 The crisps were airy and well, crispy, rather like a prawn cracker, and the aioli was creamy with a pleasantly fishy taste. Sandra, however, doesn't like seafood, so I got to have this all to myself - muahaha! 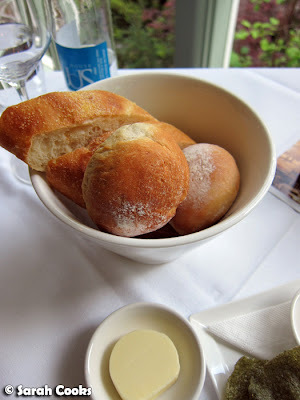 We also got bread, which tasted just as good as it looked and, importantly, came with soft butter. Apart from the white bread that you can see in the picture, there was a brown bread which I thought was wholemeal, but turned out to be mushroom bread! Now, first courses. Sandra had the white asparagus dish, a beautiful composition of different shades of white. 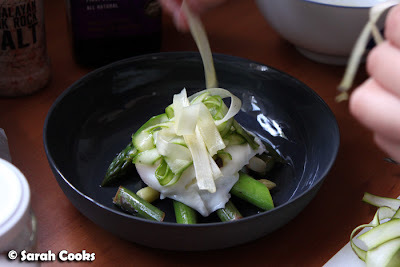 I always think of white asparagus as such a treat! The egg was cooked perfectly: soft and oozy. 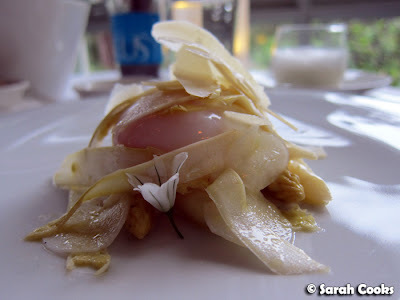 It also came with a delicious white asparagus veloute. It was so delicious, in fact, that Sandra said she'd have been happy with a big bowl of this veloute as her meal in its entirety. Big praise coming from a girl who hails from the asparagus capital of Germany! 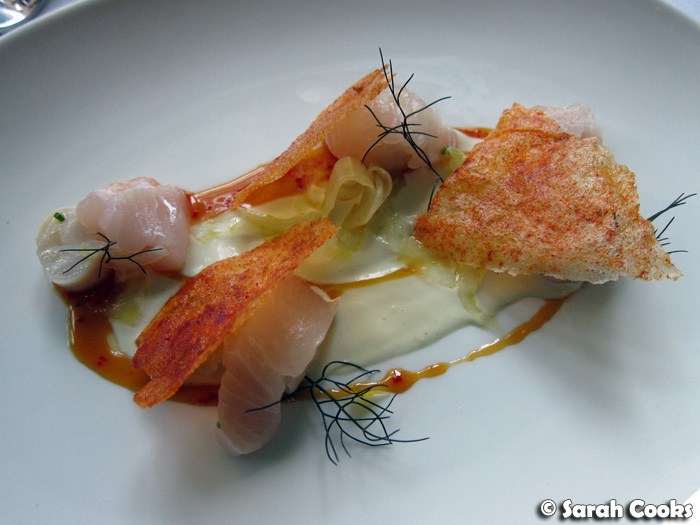 For my starter, I had a wonderful mackerel sashimi with tender pieces of octopus and a smoky paprika tuile. I loved this dish! It had such delicate, fresh flavours and a nice contrast in textures - a real pleasure to eat. Sandra had wanted to order the "Pastured beef - seared Black Angus Yearling, slow braised shin, sweetbreads, white polenta, parsley, capers", and asked if the meat could be cooked "very well done". Our waitress explained to us that that particular cut of meat would shrink quite a bit, and suggested that we order something from their "Simpler Fare" menu, which would suit being cooked all the way through - fillet steak with asparagus, red wine jus and tarragon potatoes (see below), which Sandra was happy with. 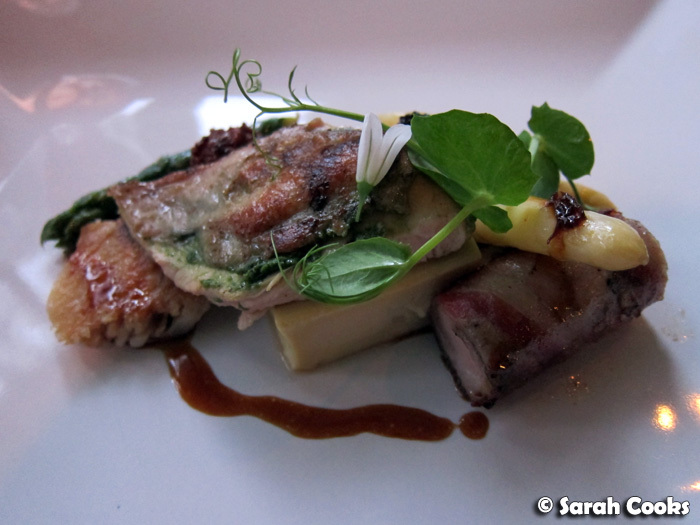 I chose the spring poussin: I just couldn't say no to the combination of "white asparagus, morels, foie gras". 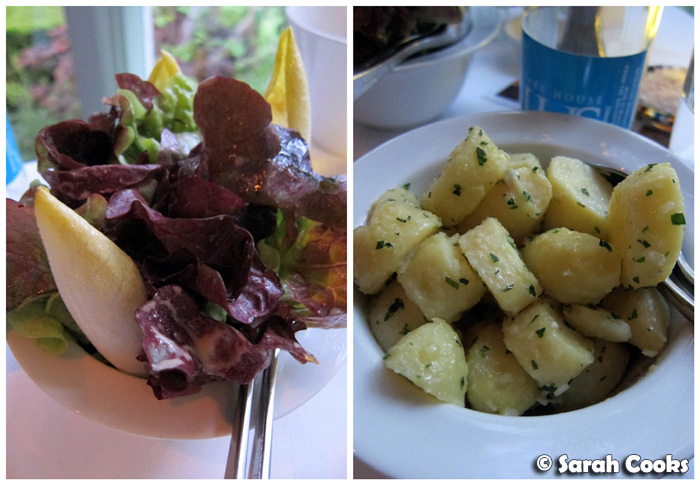 The meals came with a gorgeous mixed-leaf salad and buttery tarragon potatoes. I mentioned above that Sandra requested her steak to be cooked "very well done" - unfortunately it came out closer to medium rare, and was still very pink and juicy in the middle. (It would have been great for me, but, of course, it wasn't my steak). It was so rare that she couldn't eat it, so we actually sent it back. The waitstaff were very nice about it, and offered to take my meal and the sides back as well, so that we could both eat together. Really considerate! We were happy to wait, and fifteen minutes later our meals were brought out again. However, the steak was still not cooked well done! As you can see below, even after being sent back once, it was still pink in the middle. By this stage, the asparagus and jus had gone a bit cold (my meal, luckily, was still warm), and we didn't want to kick up a fuss, so we didn't send it back again. It was just cooked enough that Sandra could eat it, but she didn't really enjoy it. We didn't quite understand why it wouldn't be cooked through, especially when our waitress had explained the menu and offered a meal that would suit being cooked this way, and that they'd taken the trouble to take both of our meals back when we'd first told them it wasn't cooked enough for her liking. I don't mean to go on about the steak when there were so many positive aspects to the meal, but steak, like coffee or poached eggs, really is a dealbreaker: if it's not prepared exactly the way you like it, it's a real disappointment. And if you're paying those prices for your dinner, you expect your steak cooked the way you request! 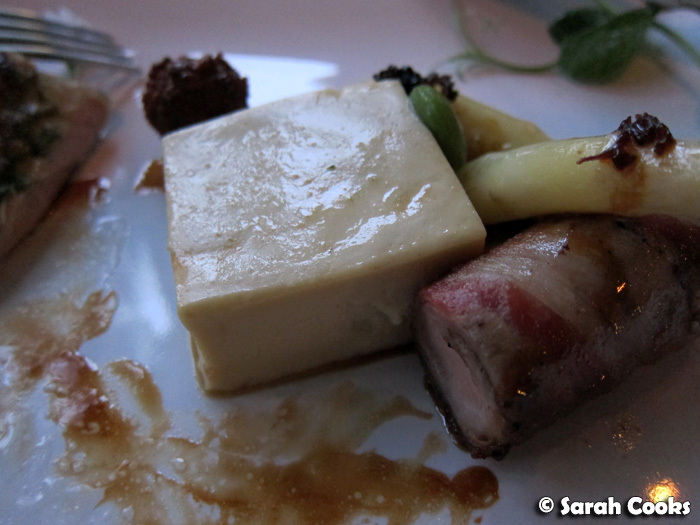 And check out this awesome block of foie gras that came with my meal! What decadence! Even I, eater-extraordinaire, could only manage half of the foie gras. A short break, and then it was time for our cheese course. 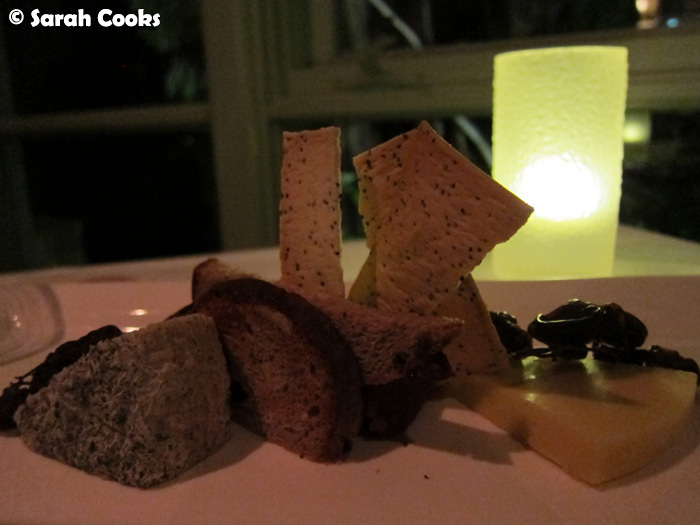 You get 50 grams of cheese in total, and can choose one or two cheeses from a selection of four. We got a lovely goats cheese, and a rather mild cheddar. (Unfortunately I can't remember the names of either cheese - I believe the goats cheese was called "Bridget's Well", but have been unable to confirm this through extensive internet searches. Does this name sound familiar to anyone? And more importantly, can you tell me where I can buy it?) The cheese came with some muscatel grapes, lavosh, and some lightly toasted slices of fruit bread. I love dried fruit and rich spices with cheese, and this bread was a fantastic accompaniment! We were both quite full by this time, so I'm glad we'd decided to share the cheese course. 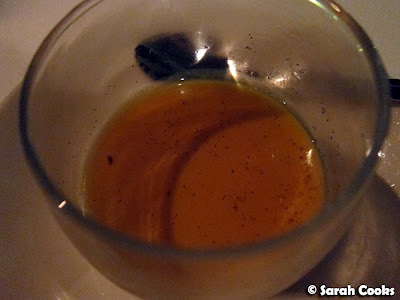 Our pre-dessert was an apple panna cotta with apple and vanilla jelly. Apples? Vanilla? 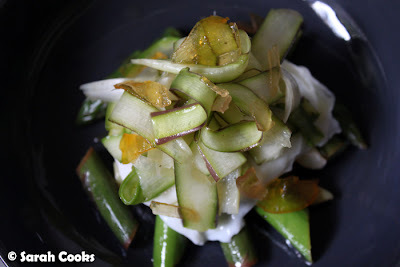 Panna Cotta? All of Sandra's dessert favourites in one little glass! I felt bad that she hadn't liked her steak, so I only had a tiny taste and let her have the rest. I was impressed with the purity of the apple flavour that came through, and the smooth and creamy texture. 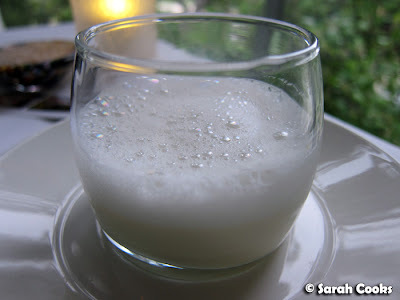 Interestingly, both panna cottas actually tasted quite different. One had a very strong apple flavour, whilst the other had a more pronounced vanilla taste. Both were delicious, but it was interesting to note the difference - clearly they must be made by hand in individual batches! And if there's a "pre-dessert", that means there must be a dessert! 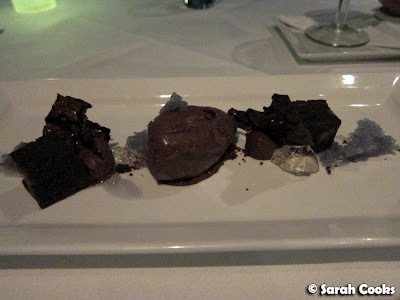 I had the "Assorted chocolate textures, early violets". 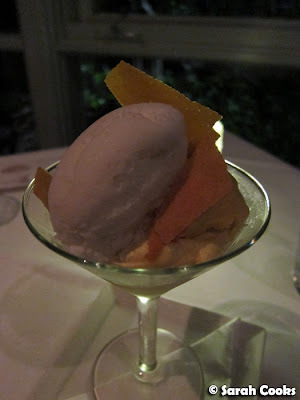 This included a quenelle of chocolate sorbet, squares of chocolate bread and butter pudding, white chocolate jelly, chocolate mousse, shatteringly crisp shards of chocolate tuille, and a violet granita. I enjoyed all the chocolate elements in this dish, especially the luscious chocolate sorbet and the unexpected white chocolate jelly. I'm not the hugest fan of violets (or floral flavours in general), so I didn't love the fact that the granita melted across the plate and combined with the other flavours - but if you do like violets and chocolate, then this dish is for you! Sandra went for the selection of ice-creams and sorbets. Our waitress had told us the flavour selection would be peach, mango and raspberry, but what actually came out was coconut, mango and raspberry. Sandra does like coconut though, so it was all good! 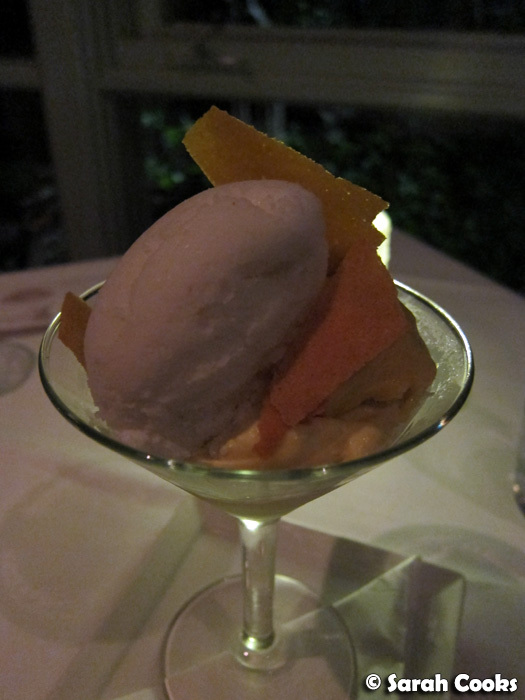 Like the panna cotta above, the sorbets were impressive in their smoothness and purity of flavour. 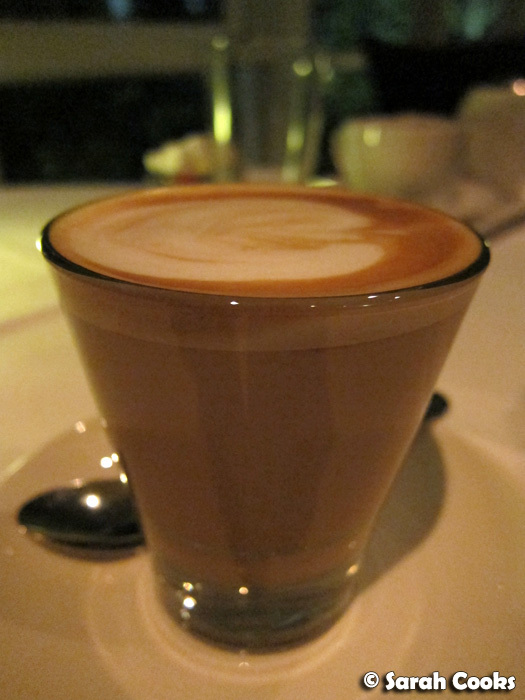 We finished up the meal with some coffee and "Sweet Indulgences". 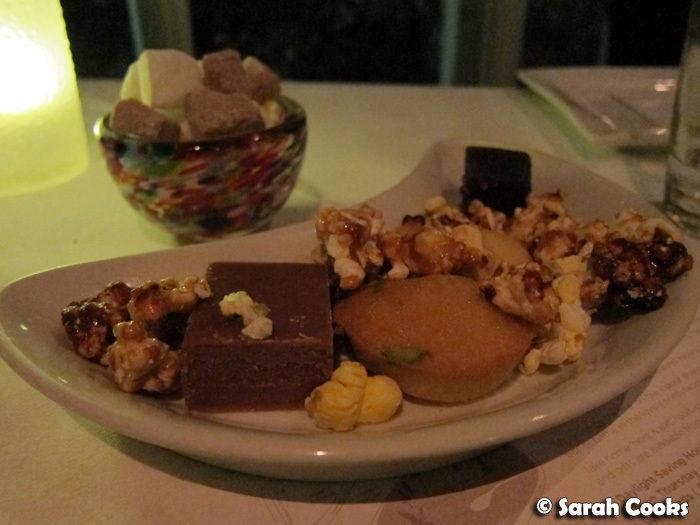 The sweet indulgences consisted of Austrian shortbread, fudge, a little jelly, a pistachio cakelet and (the standout, for me) spicy caramel popcorn. Luckily there was only a small amount of the popcorn on the plate - in other circumstances I could have easily scoffed huge quantities of it! I believe it was cayenne pepper on the popcorn, which gave it an addictive spicy kick. 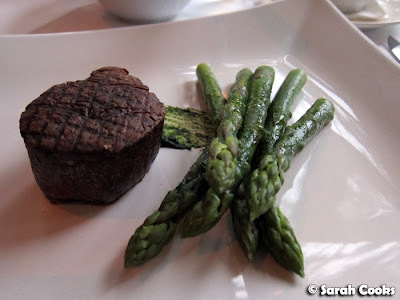 The meal cost approximately $250 for two, which I think was quite well priced considering the level of service and the quality of the produce used. 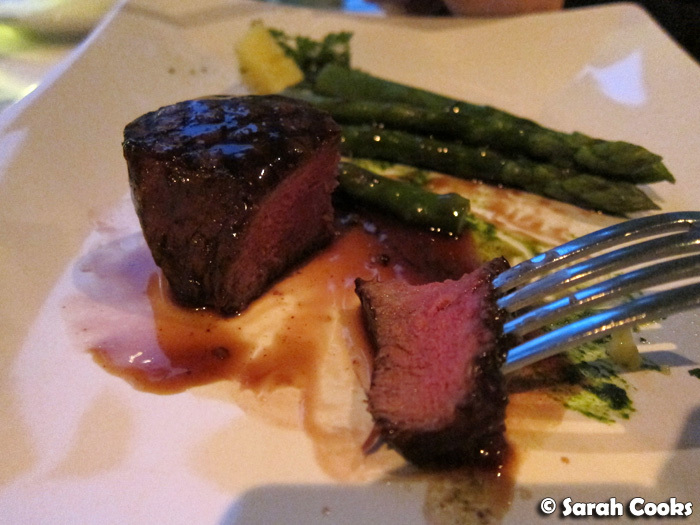 Our only gripe was with the steak, and if not for that, it would have been an ideal dining experience. I would definitely like to visit again one day.